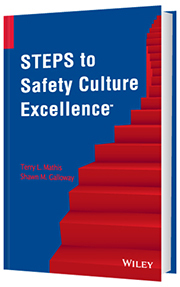 You already have a Safety CULTURE, but do you have a STRATEGY for improving it? "The workshop was outstanding! The audience were engaged and the content you provided was excellent. I had many positive comments from the delegates and a few asked for your email, so I passed it on. I hope you don't mind. I am keen to work with you again in future so I will be in touch." "This was one of the best seminars on improving safety that I have ever attended in 38 years. The practical background of the instructor, along with years of consulting experience, have added to the value of this course. Thanks for teaching us. Well done." "Shawn has excellent people skills and his in-depth knowledge of Safety and Leadership is unsurpassed. He is truly a pleasure to work. He has an endless amount of knowledge and ideas to help our company reach our goals and expectations of achieving Excellence in Safety." Emily Wilkins	, Safety Representative	, Bluebonnet Electric Cooperative, Inc.
"Shawn is an amazing speaker and presents interesting topics that are very relavant to the safety industry!" "I have worked with Shawn for almost three years as our partner for implementing and using the ProAct Lean BBS process at Rockwell Automation. He has proven himself to be a great resource and has provided creative solutions to our behavioral based process." "We engaged Shawn to help us develop a Safety Leadership Workshop that we could replicate across all our facilities. Shawn's expertise and experience were a welcome addition. He provided valuable insight to our process." "The ProAct Safety team nailed the essence of the issues facing successful managers on the safety front and has given them tools to become great leaders." "Shawn was recently hired to be the guest speaker for our annual BBS conference. He did a great job and was well received by the attendees for his knowledge of the subject and his presentation." "Working with Shawn and ProAct has been a great move for our organization. The professional expertise and personal care provided was exceptional and our safety culture has made dramatic improvements since implementing the strategies shared." Brian Ingles	, Employee Development	, Roquette America Inc.
"Shawn is an expert on BBS, his in-deep knowledge is well shared when he delivers training. He shares good advice and is always positive and encouraging. An enthusiastic speaker that lets you see he is a BBS believer and true practitioner." "Shawn is a high energy & talented professional. Thorough understanding of his business as well as the underlying principles & strategies for success. Highly recommend." "Shawn has an excellent ability to help an organization size up its current safety culture and to identify prioritized steps forward." "Shawn was thorough and explained not only the concepts of behavior bases safety but most importantly how it could work within our organization. He is quick to respond not only to questions from myself but by our ever changing environment." "I have heard a lot of speakers in my time but Mr. Terry has been one of the best. I was very impressed! I feel like Mr. Terry has given us a game plan or strategies to make us all better on coaching our guys to want to work safely." "The missing link to modern day safety." Safety First: Oh, the Irony!